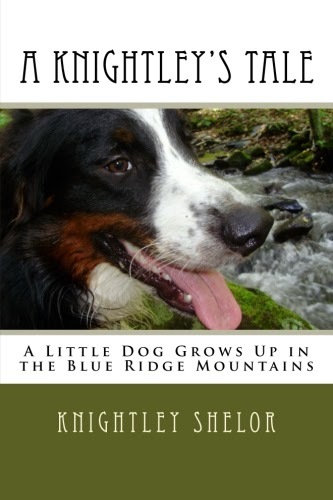 Yesterday we got the chores done and headed up the Blue Ridge Parkway to a trail just ten miles from my house. 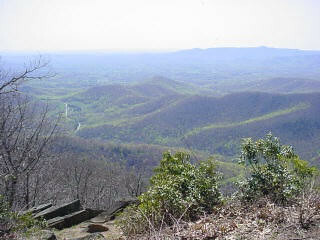 This is a view from Rocky Knob, into Rock Castle Gorge where my grandmother grew up. Even in the heights spring is bursting through the dry leaves. We saw a lot of small plants coming out with the small blooms characteristic of wildflowers. Even with flickr, I haven't been able to figure out how to put more than one picture in a post. So if you're interested in pictures of early spring wildflowers in the Blue Ridge, click the picture above and have a look at my photos tagged "Parkway"! We saw bloodroot, an early bloom that was used for a tonic by mountain people. It's toxic so not advisable as a regular thing. Mayapple was just starting to unfold above the crisp brown leaves and there were many different specimens of moss and lichen on the rocks and trees. A few trees are budding but there are a lot of bare limbs. An interesting find near the old trail shelter on the Knob was a little plant in the rocks that looked like a succulent house plant known as burro's tail. There was a different little succulent nearby, that looked like hen and chicks! Lily enjoyed her walk but she was really tired when we got home. So we left her here to rest while we went out to dinner. After we came back the SO built a beautiful set of steps up into the bunny house. Now I can go in and out with the water bottles without peril! And Dad can do some bunny wrangling! Dad went with my brother to Galax last night. Sammy was helping out with a benefit performance up there. They had a great time and interesting discussions about how this county is missing so many opportunities to take advantage of tourism! I was able to wind some yarn in the evening into center pull balls. I really want to start on the crocheted shawl idea with this lovely Shetland/mohair.